A nation’s foreign policy is a set of strategies for dealing effectively with issues arising with other nations. Typically developed and pursued by the nation’s central government, foreign policy is ideally crafted to help achieve national goals and objectives, including peace and economic stability. Foreign policy is considered the opposite of domestic policy, the ways in which nations deal with issues within their own borders. The term “foreign policy” refers to a national government’s combined strategies for effectively managing its relationships with other nations. Foreign policy is the functional opposite of “domestic policy,” the ways in which a nation manages matters occurring within its own borders. The long-term goals of the United States’ foreign are peace and economic stability. In the United States, the Department of State, with the consultation and approval of the President of the United States and Congress, plays the lead role in the development and implementation of U.S. foreign policy. As a key issue in the nation’s past, present, and future, United States foreign policy is truly a cooperative effort of both the executive and legislative branches of the federal government. Especially since the end of World War II, other executive branch departments and agencies have started working along with the Department of State to address specific foreign policy issues such as counterterrorism, cybersecurity, climate and environment, human trafficking, and women’s issues. While the worldwide influence of the United States remains strong, it is declining in the area of economic output as the wealth and prosperity of nations like China, India, Russia, Brazil, and consolidated nations of the European Union has increased. Many foreign policy analysts suggest that the most pressing problems facing U.S. foreign policy today include issues such as terrorism, climate change, and the growth in the number of nations possessing nuclear weapons. What About U.S. Foreign Aid? U.S. aid to foreign countries, often the source of criticism and praise, is administered by the United States Agency for International Development (USAID). Responding to the importance of developing and maintaining stable, sustainable democratic societies worldwide, USAID peruses a primary goal of ending extreme poverty in countries with average daily individual personal incomes of $1.90 or less. While foreign aid represents less than 1% of the annual U.S. federal budget, the expenditure of about $23 billion a year is often criticized by policymakers who argue the money would be better spent on U.S. domestic needs. While the Department of State is mainly responsible for implementing it, a great deal of U.S. foreign policy is developed by the ​President of the United States along with presidential advisers and Cabinet members. The President of the United States, as the Commander in Chief, exercises broad powers over the deployment and activities of all U.S. armed forces in foreign nations. While only Congress can declare war, presidents empowered by legislation such as the War Powers Resolution of 1973 and the Authorization for Use of Military Force Against Terrorists Act of 2001, have often sent U.S. troops into combat on foreign soil without a congressional declaration of war. Clearly, the ever-changing threat of simultaneous terrorist attacks by multiple poorly defined enemies on multiple fronts has necessitated a more rapid military response that allowed by the legislative process. Congress also plays an important role in U.S foreign policy. 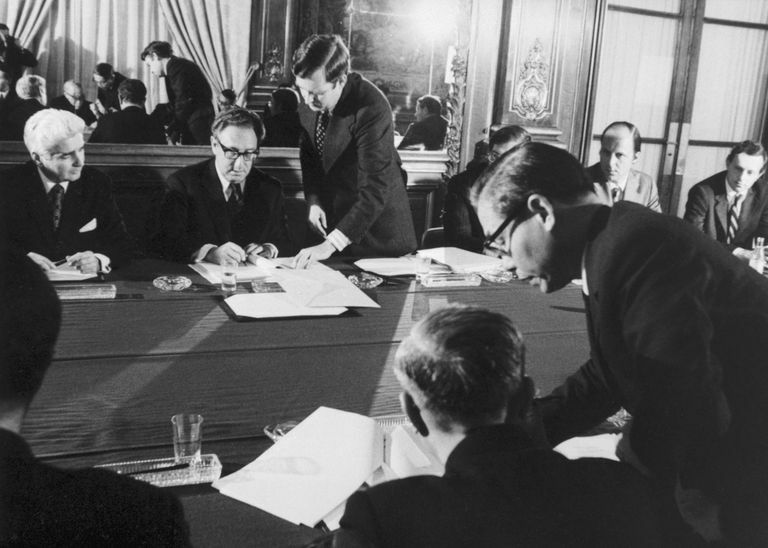 The Senate consults on the creation of most treaties and trade agreements and must approve all treaties and cancellation of treaties by a two-thirds supermajority vote. In addition, two important congressional committees, the Senate Committee on Foreign Relations and the House Committee on Foreign Affairs, must approve and may append all legislation dealing with foreign affairs. Other congressional committees may also deal with foreign relations matters and Congress has established numerous temporary committees and sub-committees to study special issues and matters relating to U.S. foreign affairs. Congress also has significant power to regulate U.S. commerce and trade with foreign nations. The United States Secretary of State serves as the foreign minister of the United States and is in charge of conducting nation-to-nation diplomacy. The Secretary of State also has wide responsibility for the operations and security of the nearly 300 U.S. embassies, consulates, and diplomatic missions around the world. Both the Secretary of State and all U.S. ambassadors are appointed by the president and must be approved by the Senate. “Foreign Relations of the United States.” U.S. Department of State Archives. “Milestones in the History of U.S. Foreign Relations.” U.S. Department of State Office of the Historian. US Foreign Aid by Country - Foreign Aid Explorer. United States Agency for International Development. “Efforts to Improve Management of U.S. Foreign Aid.” U.S. Government Accountability Office. (March 29, 1979). U.S. Foreign Policy 101: Who's Responsible?